rec. Grosser Saal, Kultur-Casino Bern, 23-24 September 2004, 12 October 2004. Works for violin and orchestra are from live concert performances. Carl Reinecke lived a long and productive life, working his way up the musical ‘food-chain’ from conducting a small volunteer orchestra and teaching private lessons to becoming music director of the Gewandhaus Orchestra and professor in the Leipzig conservatory. His responsibilities in these latter positions were considerable, and it is a wonder that he found the time to compose the sizeable number of works that he did. Yet, his opus numbers exceed 250. As a teacher, his methods were often ridiculed, but a number of his students went on to notable success, holding their teacher in high regard. 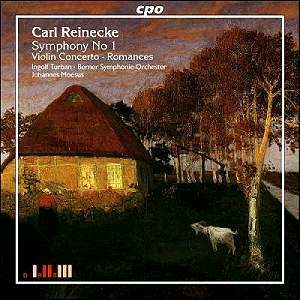 Reinecke’s major influences were Mendelssohn and Schumann. Their respective early deaths left the composer in an artistic quandary, he being inclined to compose in traditional forms of absolute music that were decidedly out of fashion amongst prominent composers of the time with the notable exception of Brahms. Toward the end of his life, he became resigned to the belief that most of his music would be forgotten. Little did he know that recordings, in their infancy at the time of his death, would serve as the vehicle to revive interest in his work, and the works of his contemporaries some decades later. The Symphony No. 1 of 1858 was actually his third effort in the genre, the two earlier attempts withdrawn and now lost. The opening movement is reminiscent of Schumann and starts out with a couple of promising themes. They remain underdeveloped though and by the movement’s end have disintegrated into somewhat clichéd gestures. The second movement reflects Brahms’ influence and opens with a promising melody. Sadly a lack of development leaves us still wanting more. The third movement scherzo is the most successful. The tunes are charming and there is some very fine writing for the winds in the second theme. The final movement is boisterous, but some sloppy ensemble on the part of the Bern orchestra and some slipping intonation in the strings bring an otherwise professional performance to a lackluster and rather disappointing end. The Violin Concerto of 1876 had an auspicious enough beginning, the first performance being given by none other than Joseph Joachim. According to all reports, the performance was everything that a composer could have wanted right down to the good reviews. This was heartening for the composer whose early violin concerto, written for equally famous Ferdinand David was often truncated by the soloist and never given the kind of serious attention that the later work received from Joachim. This is a substantial work that fares thematically and developmentally better than the symphony. With its lush orchestration and attractive solo writing, it’s a bit of a wonder as to why it has lain dormant for nearly a century. Ingolf Turban is a fine soloist with a warm and lively tone and plenty of fingerboard mastery to bring off the flashier passages with ease and aplomb. One might wish for a bit more commitment from Johannes Moesus and the orchestra however. Their playing, while perfectly competent, lacks any sense of urgency or passion. The performance leaves the impression of its having been an assignment met with only marginal enthusiasm. The disc is rounded off with two charming romances that are nicely played and pleasant as encores. This isn’t a press-stopper but it is worth a listen. There is much for lovers of nineteenth century music to enjoy.